The Camden Modern Conference Table and storage units will rise to the occasion, meeting the needs of any contemporary meeting room. It’s got style, it’s got function, and it’s got class. The Camden is available in the size, material, and color of your choice. It’s fully capable of accommodating the power, data, and audio you need to be in full communication. The Camden Modern Conference Table will completely enclose all wiring to maintain your table’s clean profile. The Camden Modern Conference Table and storage accessories are available in several wood types, laminates, and accent materials. If getting it just right for you involves a certain look, color, or price, you’ve got options. The Camden is supported by a radius base in your choice of wood veneer, HPL, or specialty laminate. Select the conference tabletop that best suits your meeting room environment. Inlaid into the tabletop are two squares of limestone (other stones available). The Camden gives you a choice of finish sheen: dull, satin, semi-gloss, or high-gloss for wood veneer surfaces. Our design-and-build program is organized around top-quality craftsmanship and construction, regardless of the materials you select. 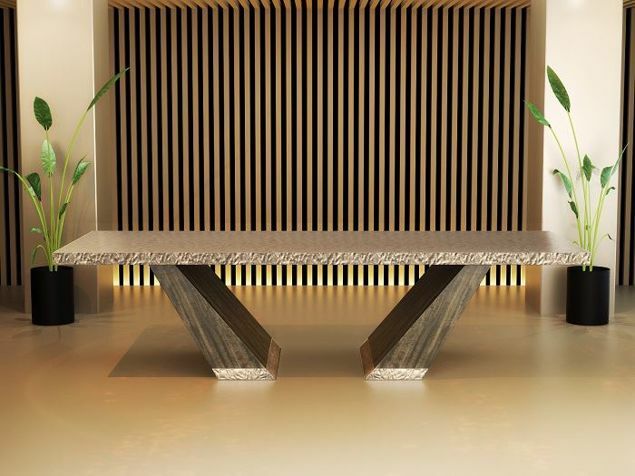 The Camden table, as shown above, is designed with a 96" x 42" top with two inlaid natural limestone squares, adding a dash of earth to your modern meeting environment. The table base is presented with brushed aluminum lining its U-shaped base. 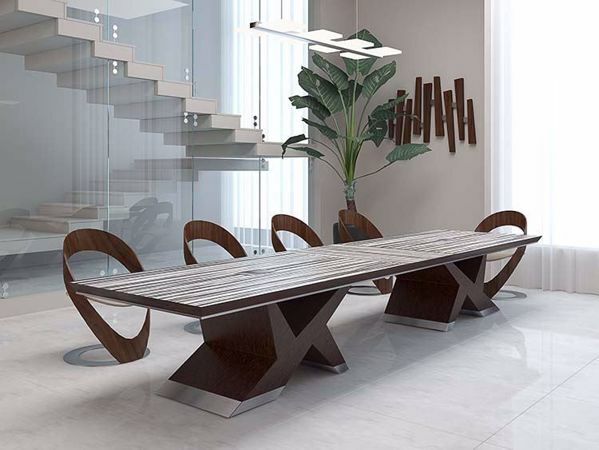 The deep mahogany finish, against a backdrop of metal and stone, creates an interesting contrast. Your furniture is built to order, and can be customized with anything you see...or according to your own vision for your conference room. Call us at 855-699-0334.